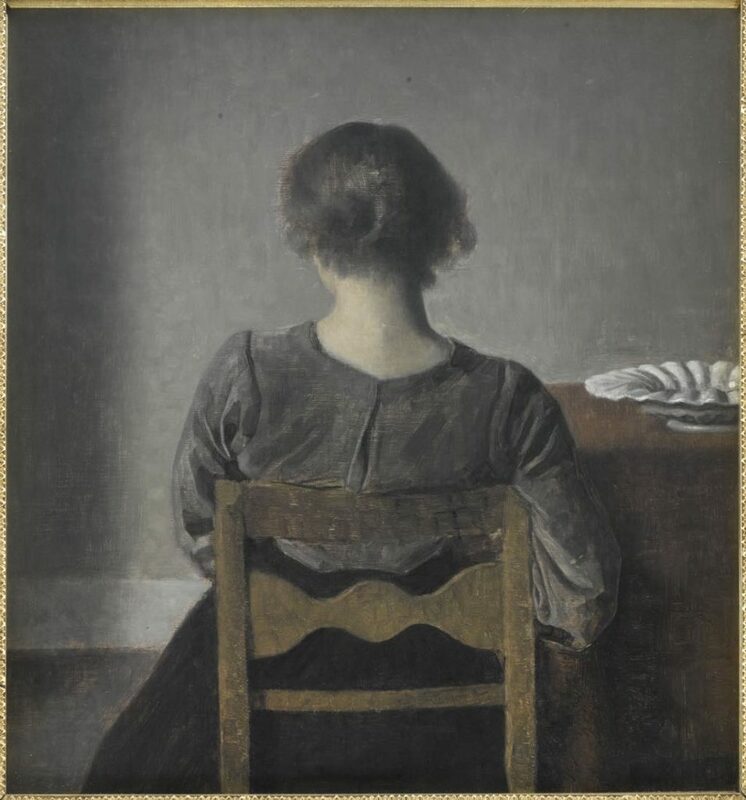 A Vermeer-like feeling of tranquility emanates from many of the paintings by Vilhelm Hammershøi (1864-1916) on show at the Musée Jacquemart-André. The comparison with Vermeer also springs to mind because Hammershøi painted mostly interior scenes, often with a figure seen through an open door or posed next to a window, but his work differs in many ways from the Dutch master as well. 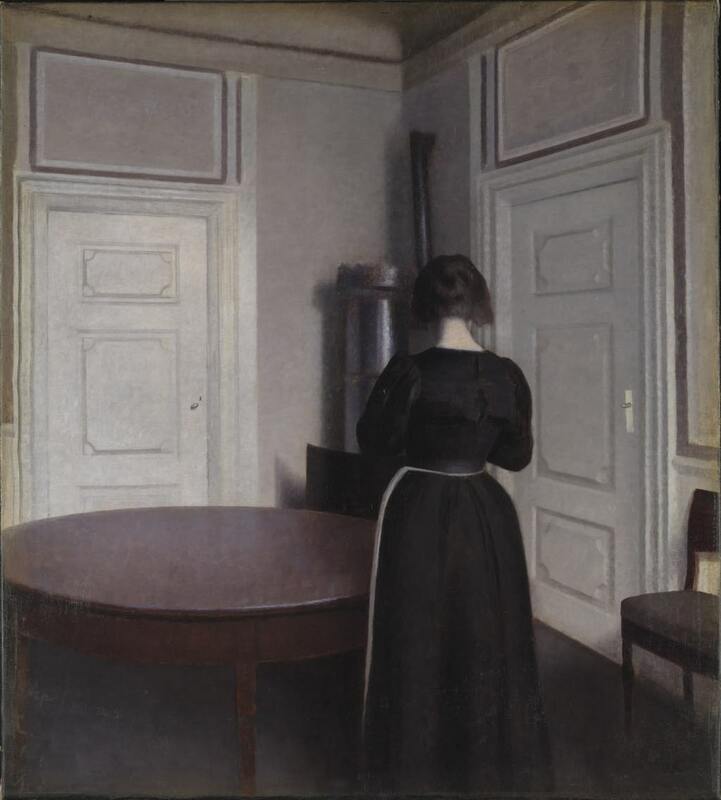 Some of Hammershøi’s paintings often evoke an odd feeling of detachment not seen in Vermeer. And, while Vermeer painted sharply detailed works in jewel-like colors, Hammershøi eliminated most details – and those that remain blur into the misty surface – and restricted his palate almost exclusively to shades of gray. Many of the works in the exhibition are devoid of humans, concentrating simply on form and light. When there are figures, mostly women (usually his wife Ida), they almost never look at the viewer but rather avert their eyes, turn their backs or stare blankly into space, giving some of the paintings an eerie or even lugubrious quality that makes one wonder about the psychology of the man who painted them. The accompanying text reveals almost nothing about his biography, however, only that his parents recognized his talent early and started him on drawing lessons when he was only eight years old. In a short film, we hear that the drawings of monsters he made as a child were so realistic that he scared himself when he looked at them. 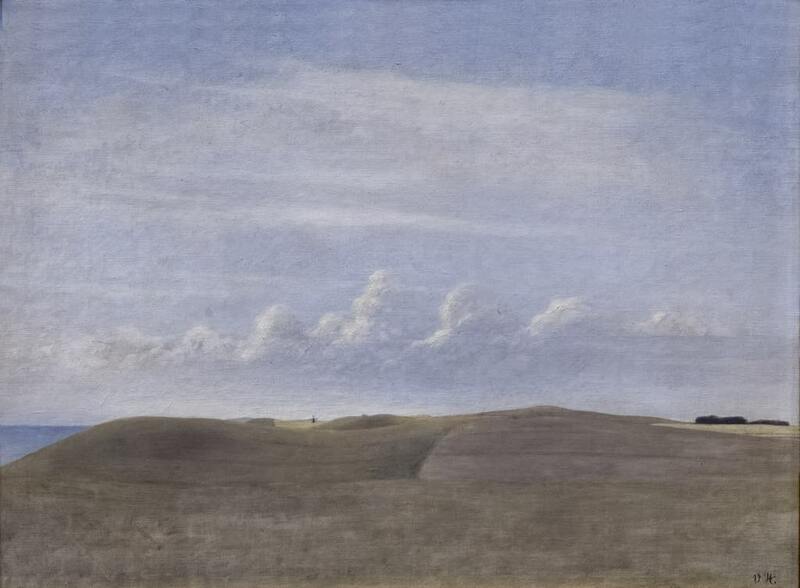 The British comedian Michael Palin had the same desire to know more about the artist and went in search of the man behind the paintings in the 2008 documentary Michael Palin and the Mystery of Hammershøi (watch it here), but he didn’t find out much more and concluded that Hammershøi was just a painter painting in a way that pleased him. The slightly disturbing quality in some of the paintings is absent from the quietly beautiful figure-less scenes. 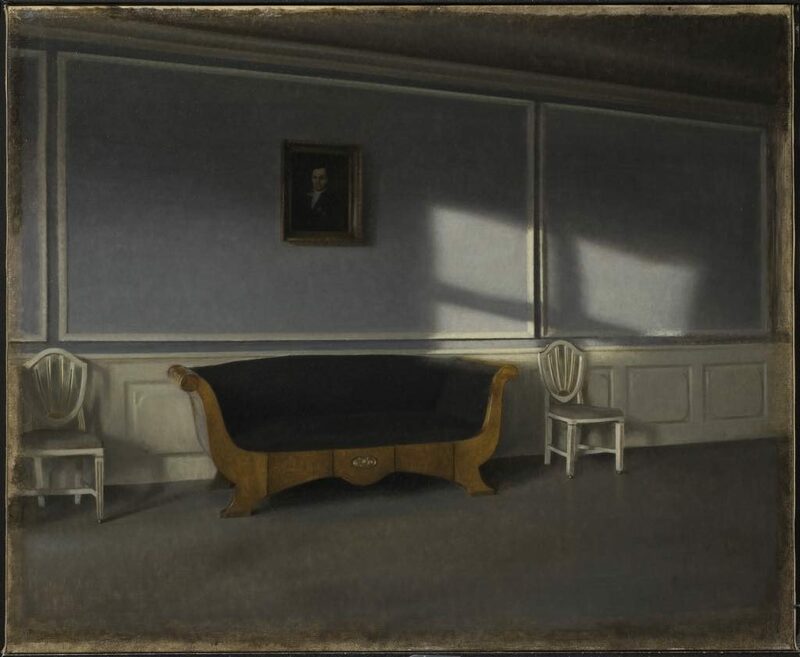 Interestingly, one of the paintings here, “Interior, Ray of Sun on the Floor” (1906), was purchased by a friend of Hammershøi’s, who folded over the left side of the canvas before framing it to conceal the figure, leaving only the window with the sun shining through the panes onto the floor and the crooked door next to it. It’s quite lovely that way. (For the curious, an art restorer working on the painting shows Palin the missing figure in his documentary). For someone who seemed to spend so much time indoors, Hammershøi actually traveled extensively and painted many buildings and landscapes. Like many of his interiors, the latter are devoid of human presence and evoke a feeling of silence and time suspended. The exhibition presents some works by Hammershøi’s contemporaries who painted similar interior scenes but in brighter colors. Lacking the mysterious atmosphere of Hammershøi’s work, they point up his originality. The artist was appreciated in his lifetime, but he was quickly forgotten after his death. In the 1930s, the Danish National Gallery in Copenhagen even returned to the donor a gift of 28 of his paintings, a decision they now regret. Don’t miss this show, something new for Paris. Hammershøi is a painter you just might fall in love with.